This is what I know about sound… for now. Bernie Krause, the author of The Great Animal Orchestra (2012), started his career as a session guitarist for Motown recordings–he even played in The Weavers (not Motown) for a spell–before entering the world of soundscape engineering. He often describes how animals “rely on their aural habitat” to survive as much as on precious resources like food and shelter. 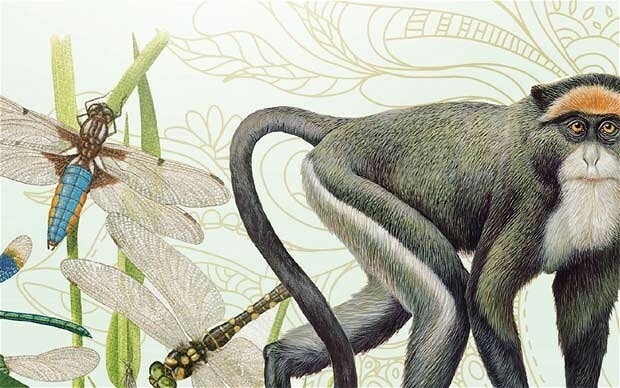 He even suggests that all human musical expressions stem from the diverse rhythms and sounds of the natural world. Food for thought and music for tasting. There’s no such thing as silence. What they thought was silence, because they didn’t know how to listen, was full of accidental sounds. You could hear the wind stirring outside during the first movement. During the second, raindrops began pattering the roof, and during the third the people themselves made all kinds of interesting sounds as they talked or walked out. Oliveros explores similar ideas in her concept of “sonic awareness,” or the “synthesis of the psychology of consciousness, the physiology of the martial arts, and the sociology of the feminist movement.” Did you get all of that? Neither did I, but her mission to train our ears to hear for the sake of listening is a worthy cause. She’s also colaborated with artist Ellen Fullman and her primal Long String Instrument. 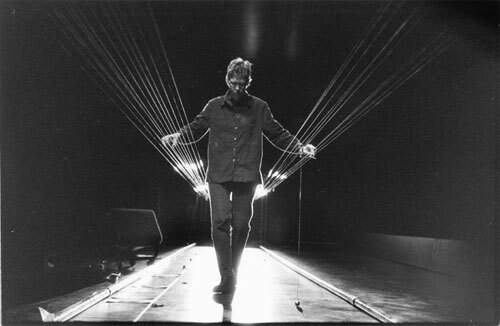 Ellen Fullman and her Long String Instrument. Photo by John Fago. I heard someone claim the Western world doesn’t distinguish between hearing (passive) and listening (active) like other cultures. I can’t verify the sentiment, but I find it intriguing given the trend toward an omnipresent ambient noise in our lives. I think of those I know who need noise to sleep, to work, to drive, to cook, and really in every part of life. I’m curious to see how this sea change toward using noise to treat the symptoms of our globalizing world will affect humans in the long term. 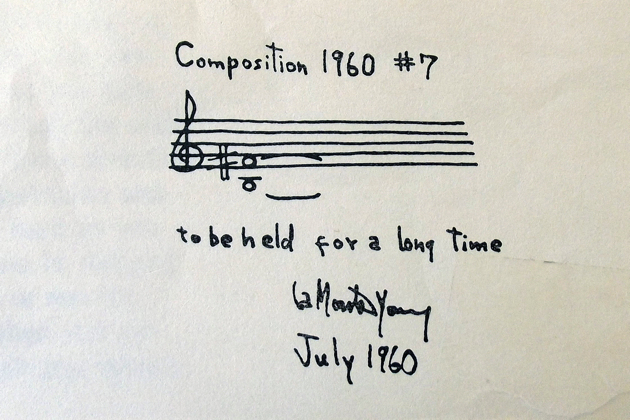 Concerned about the same issues, La Monte Young and his friends with their prose scores intended to Flux everything up. Perhaps his most (in)famous/beautiful score is Composition 1960 #7. The notation shows a fifth between B and F# with the words “to be held for a long time.” Infuriating and brilliant. Young challenges our expectations of music by releasing the variable of time! Interestingly, this piece is a mirror of 4’33” (Cage gave the time without the pitches and Young the opposite), yet it straddles the same world philosophically. So what? How and why do these experiments in listening relate or even matter. These (crazy?) ideas are rooted in Italian Futurism. In 1909, poet Filippo Marinetti published this manifesto in the Italian paper Le Figaro. It cited the beauty in speed, technology, and the “new” across disciplines. 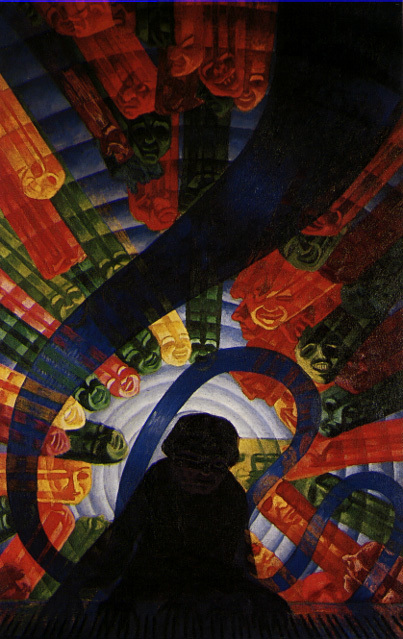 However, Futurism’s most memorable participant in aural thinking was the composer Luigi Russolo, who wrote The Art of Noises (1913). This text primed the minds for mid-century avant-garde composition. Though Futurism favored man made sounds over the natural world, Russolo blew the top off what music should and could be (something that will be debated in coffee houses and undergraduate theory class until the end times). Perhaps more importantly, these guerilla artists were the first to exploit mass media to extend the reach of their message. Even a short, unedited sound recording captured in a calibrated and comprehensive way does not lie. Wild soundscapes are full of finely detailed information, and while a picture may indeed capture a thousand words, a natural soundscape is worth a thousand pictures. This entry was posted in Issues, Miscellany and tagged acoustic ecology, composition, experimental, sound. Bookmark the permalink.